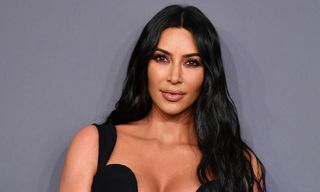 It’s fair to say the term “fashion icon” is bastardized as often as “haute-couture” in the social-media-driven realm of the internet, where influence is measured solely by “likes” and “followers”. Though the term “icon” is applied very loosely today, thankfully, civilization still privileges a small cast of original, divisive and perennial trend setters whose cultural influence is incalculable by any digital analytics tool. 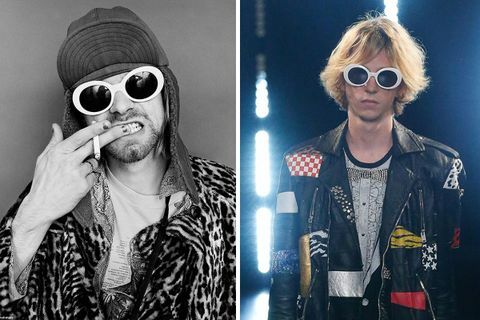 One of these said icons is the late, great Kurt Cobain, who would have turned 50 this year and still continues to shape pop culture, fashion, and music. Though Cobain’s grunge-uniform is constantly rehashed on fashion’s ever-rotating hamster wheel of trends, Cobain’s loudest reverberating legacy remains his unapologetic anti-establishment attitude. He was an avowed feminist at a time where men barely spoke out about women’s issues, an advocate of the LBGTQ community at the height of the AIDS crisis, and he was never afraid of calling out bigotry or racism. There’s a reason why fashion bibles like Vogue will continue to reference Kurt Cobain as often as someone like Audrey Hepburn; he has an enshrined place in the fashion’s pantheon. Though it’s probably the antithesis of the punk attitude he lived for, there’s no denying how his gender-subversive fashion choices have gone on to inform a radically new idea of androgyny that resonates with millennials today and rejects the archaic social conventions that Cobain once rallied against. 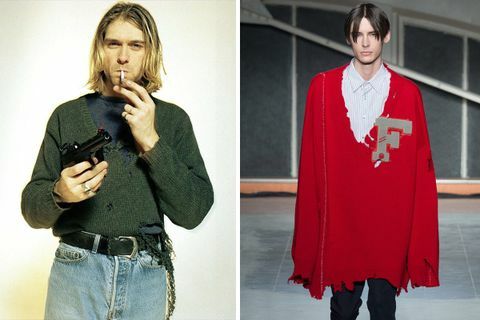 From Cobain’s love of disheveled denim to worn-in fabrics to grandad cardigans, we take a deep dive into today’s dominant trends and show you how Cobain did them all first. 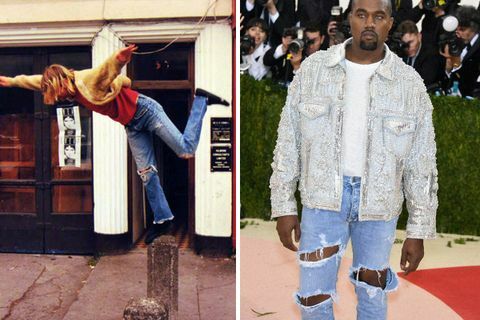 Kurt to Kanye might not be an obvious connection at first glance, but there’s no doubting the ways in which Yeezy has managed to remix elements of the ‘90s grunge movement with the contemporary codes of streetwear. Since Yeezy Season 1, oversized everything has been raging. Elongated sleeves are ubiquitous, proportions have long been overblown and shapes are ballooning like never before. Given that Demna Gsvsalia worked on Yeezy Season 1, it makes sense that Vetements have similarly carved out an aesthetic niche based on XXL shapes. The oversized trend has gone on to inspire a runaway street style phenomenon. Naturally, it was Cobain who first made the slouchy silhouette his own aesthetic signature in the ‘90s. Literally, everything he wore was completely ill-fitting, comically huge and lumbering. It’s one of the more surprising trends to emerge as of late, but since the FW16 collections, sleepwear as outerwear has been writ large across the runways. 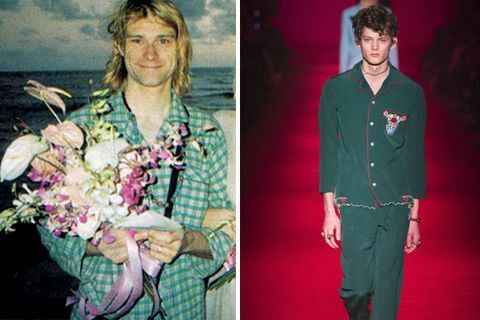 Of course, there’s something majestic about a pajama shirt when it’s rendered in Italian silk (thanks, Gucci) but Kurt Cobain wearing pajamas to his wedding definitely sits on the more subversive end of the sartorial spectrum. Cobain reportedly opted for PJs because he was too lazy to put on a tux. Iconic. 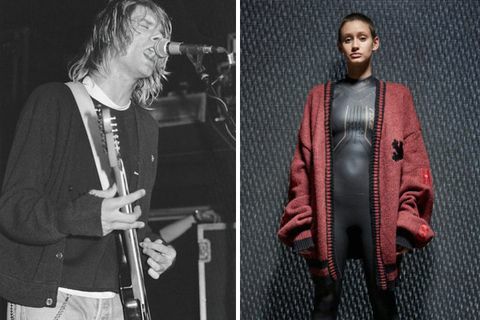 Who knew Kurt Cobain’s ratty, moth-eaten, thrift-store knitwear could have such staying power? The late rock star’s love for sloppy, careworn, ripped and patched back knitwear seems like an unlikely reference today. 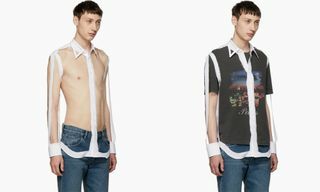 Of course, the designer responsible for its encroach into high-fashion is Martin Margiela. 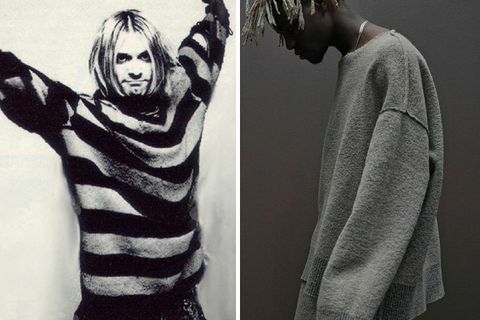 There is probably a gamut of aesthetic comparisons to make between Cobain’s anti-fashion stance and Margiela’s off-kilter design DNA, like the designer’s love for distressing, conspicuous wear, XXL-scale shapes. Though Yeezy Season One also featured tattered knits, more recently, it was Raf Simons’ whose FW16 collection that paid homage to Cobain, by way of Margiela. 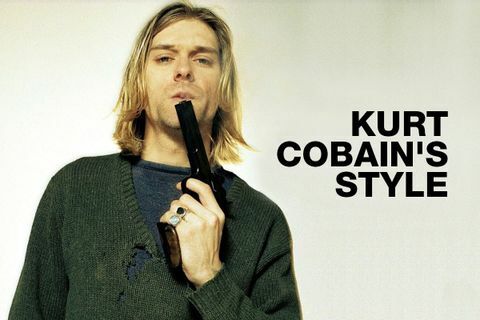 Today’s street style capitals are filled with fashion folk donning billowing, distressed sweaters with destroyed hemming, probably unaware of their accidental salute to Cobain. Cobain loved his alien-esque, Jackie O shades by Christian Roths. Arguably, they can be considered one of the most iconic features of the Grunge God’s immortal style. These simple, pale oval shades basically cemented Cobain’s grubby, androgynous cool. Silver Lining Vintage x Opening Ceremony reissued these frames back in 2010 but their infectious hype has far from waned since then. Most notably, Hedi Slimane reprised the silhouette for his SS16 men’s collection at Saint Laurent Paris and they’ve enjoyed heavy rotation among the Instagram “it crowd” since. Distressed denim has always been a hallmark signature of grunge style, and that’s thanks to Cobain and his enviable sense of nonchalance when it came to literally everything. Cobain wore his angst as well as he wore his denim, and it was always vintage, sandblasted, washed-out, worn-in, ridden with holes, shredded and ripped as hell. Though Cobain preferred his jeans on the baggier side, the more recent ripped denim revival has been largely flanked by slimmer silhouettes. 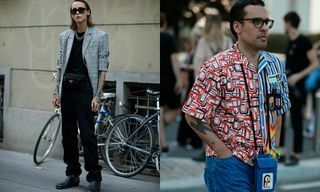 Of course, certain brands like Marques’Almeida and Faustine Steinmetz are solely focused on a millennial take on nineties denim trends but it’s now taken a universal approach, with big brand behemoths from Gucci to Versace all jumping on the trend. Of course, Kanye wearing ripped jeans to the Met Ball in 2016 has probably helped solidify this trend’s recent dominance too. Nirvana T-shirts are donned by everyone from trend-riding millennials to Kanye West to Justin Bieber to Kim Kardashian and in an ironic twist of fate, it was zeitgeist-shaker Kurt Cobain who unapologetically worked the tribute tee into his garb of off-beat grunge. Nowadays, the trend for band tees exclusively indulges the mainstream icons, however, Cobain chose a more underground approach. Most famously, he wore the ‘Hi, How Are You’ shirt (bearing Daniel Johnston’s album art) at the 1992 MTV Video Music Awards, inadvertently thrusting Daniel Johnston, an outsider artist at the time, into the limelight. 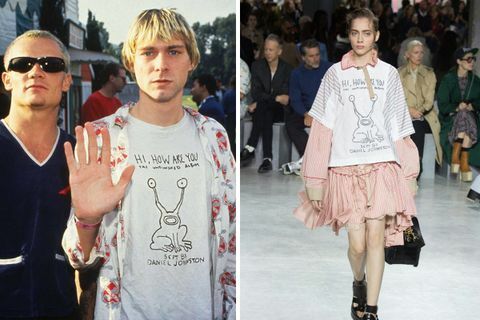 Thanks to Cobain, Daniel Johnston’s iconic artwork has reached cult status, and the singer even lent his illustrations to Supreme back in 2012. Fast forward a few years and high-fashion have followed suit. Japanese brand Sacai made a subtle nod to Cobain, with its own take on take on the ‘Hi, How Are You’ shirt, styled over a grungy-girl-on-the-prairie look for the brand’s SS17 collection. 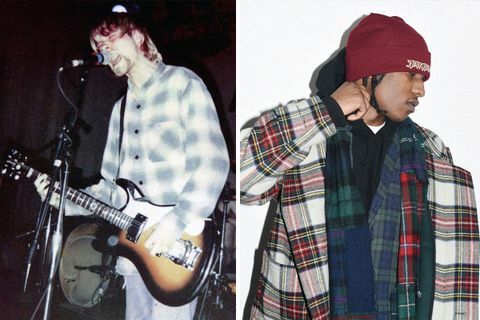 Another iconic piece of the grunge uniform that owes its timelessness to Kurt Cobain is the flannel shirt. Despite the dominance of athleisure in recent years, the flannel shirts have survived the purge unscathed and it remains a trend-proof, wardrobe staple. More recently, it hasn’t been guitar-shredding, indie stars who have reinvented grunge but the likes of A$AP Rocky, Kanye West, and Rihanna. Grunge staples like the flannel shirt are now being readily mixed with luxe streetwear. A$AP Rocky loves to wear a flannel over a hip-hop tribute tee, Kanye readily pairs his plaid with Supreme and Rihanna is happy to mix up an oversized flannel shirt with a bucket hat and a pair of Nike Air Force One. Back in 2015, a cardigan worn by Kurt Cobain on Nirvana’s 1993 MTV Unplugged performance sold at auction for a whopping $137,500. Cobain wore his fuzzy cardi, sloping slightly off his shoulders as he strummed through “The Man Who Sold the World” and “Polly”, paired with a simple white t-shirt and pair of baggy jeans. It’s an iconic look that epitomizes Cobain’s nonchalant approach to fashion. 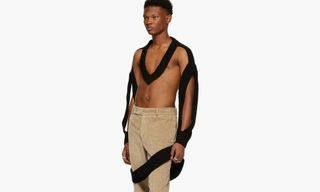 Over the last few years, the grunge appeal of the cardigan has slightly waned, but recent seasons on the fashion calendar have signaled a revival of sorts. From Gucci’s geeky take on the grandad cardigan to TAKAHIROMIYASHITA TheSoloIst’s FW16 collection that featured a literal replica of Cobain’s cigarette-hole-filled cardigan. This season, Kanye West presented his take on the grandad cardigan in a deep burgundy shade for Yeezy Season 5, so it’s safe to expect an onslaught of oversized, billowing cardigans everywhere now. Kurt Cobain might be an involuntary style icon but his lessons in casual layering remain unrivaled, even today. Even when he was performing onstage, under the gaze of bright lights and a demanding live set, Cobain preferred to wear a heavy abundance of layers. Cobain was a deft hand at mixing textures and colors. It didn’t matter if it was graphic t-shirts, light wash denim jeans, a flannel shirt and oversized knitwear, his blasé attitude to fashion is what imbued his look with a sense of impenetrable cool.  More recently, as streetwear codes mutate into new territories and combine everything from motocross culture to religious iconography to athleisure, brands at the upper-echelons of fashion are taking note. Balenciaga’s FW17 Menswear collection, under the creative directorship of Vetements’ Demna Gsvsalia, is a superb example of how Cobain’s lessons in grungecore remain resolutely relevant. 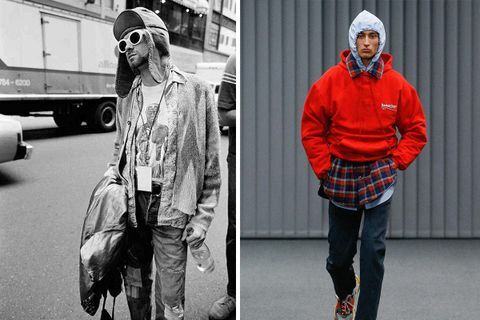 Though Cobain’s style was slightly more unhinged than Balenciaga’s guy, the offhand approach to layering owes its trending status to Mr. Kurt Cobain. It shouldn’t really be a surprise to die-hard Nirvana fans but Kurt Cobain was basically a feminist fashion icon. Though Cobain’s style is immortalized by grunge, he was often man enough to indulge his femininity too. Most famously, he graced the cover of 1993’s September issue of The Face, donning a buttoned-up tea dress and chipped red nail polish. Though Cobain can’t be solely credited with widening mainstream society’s understanding of the performativity of gender, he certainly helped the cause. Over recent seasons, conversations around gender have also permeated the fashion industry. On runways from Milan to New York, from Prada and Gucci to Vetements and Hood By Air, binaries have been queered and stereotypes have been subverted. Though there a whole host of queer icons to thank for fashion’s sincere embrace of gender fluidity, Kurt Cobain’s “wokeness” was way ahead of its time. Inspired by Kurt Cobain’s grunge uniform? Lucky for you, we’ve found 9 of the best ripped jeans to buy right now.